It’s nearing the end of the week already (I still can’t believe it) and I’m here to help you out again with your next dinner or lunch idea! Pasta, pasta is one of those delicious meals that is basically a hit with everyone and not only is it super simple to whip up a pasta dish, they’re always filled with flavour and goodness. 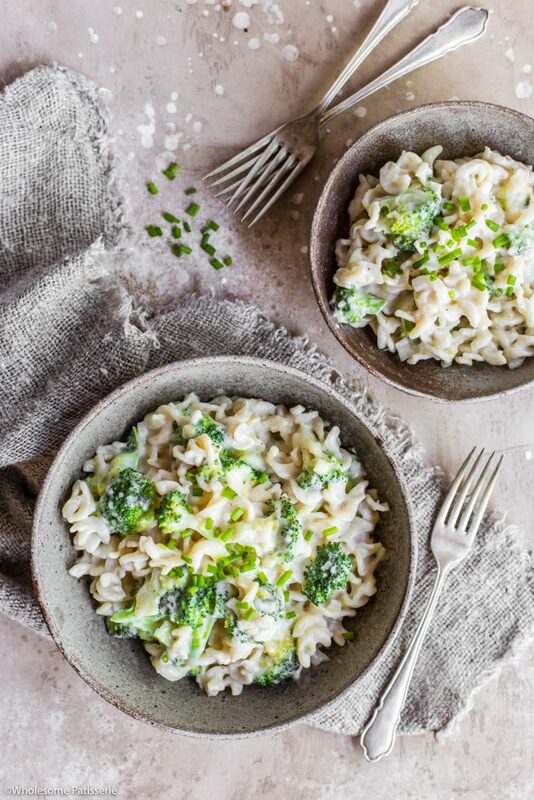 I made this absolutely glorious Creamy Broccoli Pasta over the weekend for dinner and it was incredibly yummy! Oh and also quick and easy to whip up! 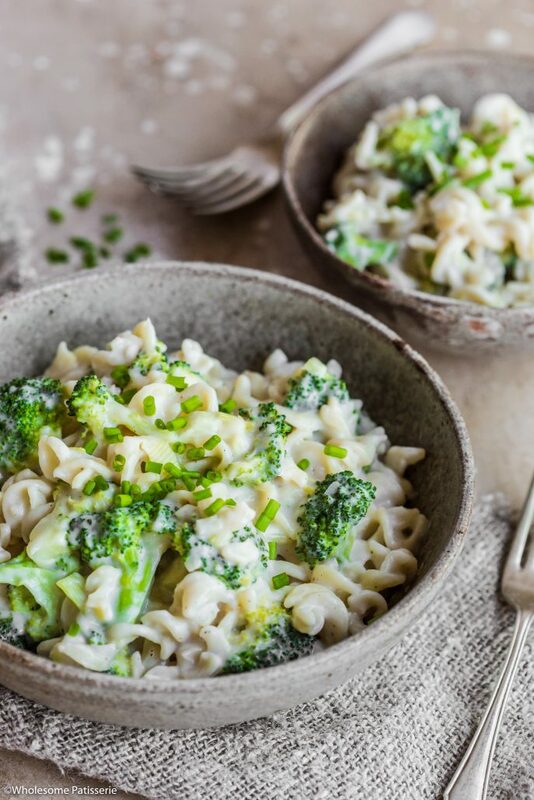 I created this creamy broccoli pasta completely vegan but I also make this white sauce recipe using butter too, so if you don’t mind the dairy, butter is also a great option. Also, usually in white sauce you add cheese, but as I said, keeping this completely plant-based, I added nutritional yeast which offers that “cheesy” flavour – YUM! You can find nutritional yeast from your local health food store and possibly even you supermarket. It adds another layer of flavour to this creamy “cheesy” pasta. It’s a perfect mid-week meal idea for everyone included! So will you be making this soon? Scoop out 1 cup of the cooking water and set aside. Drain off water and set pasta aside until ready. In a large pot, melt oil over a medium-high heat. Add sliced leek and sauté for 2 minutes to soften. Stir through minced garlic and sauté for a further 3-4 minutes or until leek is soft and slightly translucent. Add in broccoli florets, pinch of salt and mix well with the leek for 2-3 minutes or until broccoli begins to cook through. Reduce heat to medium-low and cover pot with a lid. Let broccoli steam in the pot for 3-4 minutes or until tender, stirring occasionally. Whilst broccoli is cooking, make the white sauce. Melt oil in a medium size saucepan over medium heat, add minced garlic and cook for 1 minute until fragrant. Stir in flour, cooking gently for 1 minute with a whisk. Gradually pour in milk, whisking until thickened and small bubbles begin to appear on the surface, don’t boil. Reduce heat to low and add in nutmeg, salt, pepper and nutritional yeast, whisk well. Turn off heat, set aside. 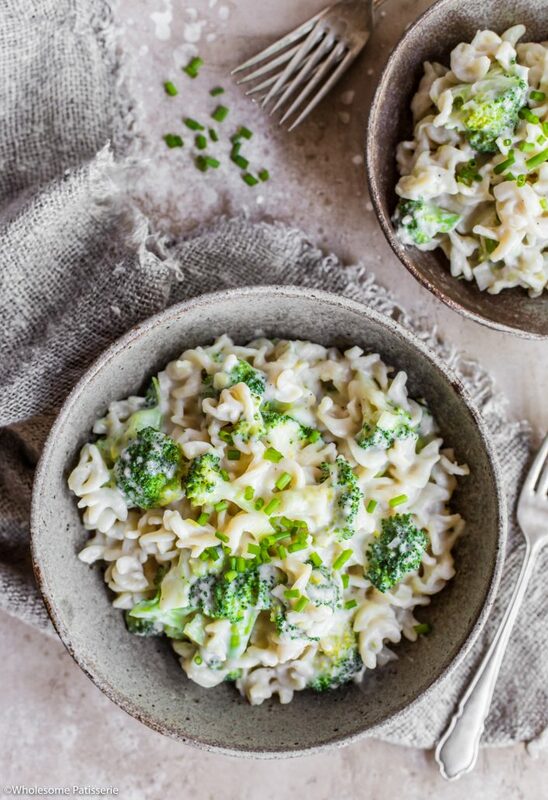 Once broccoli is soft and tender, stir through cooked pasta. NOTE: You may want to rinse the pasta under hot water to loosen it up again. 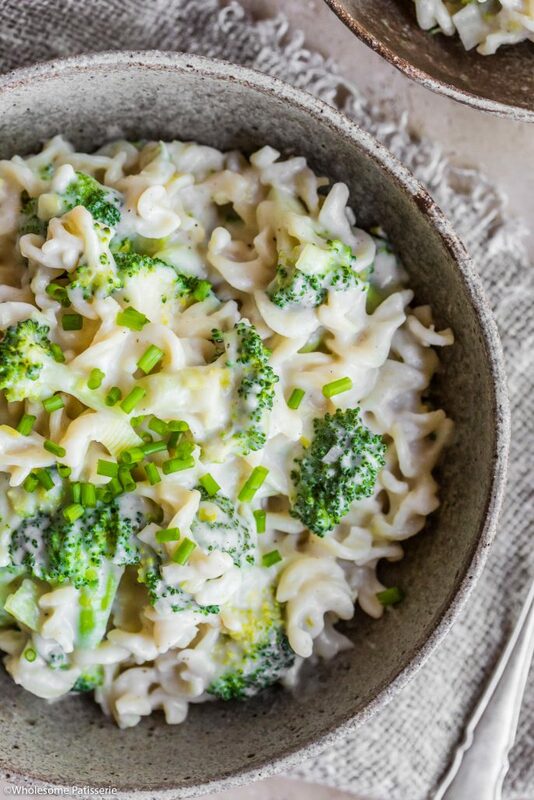 Carefully pour the white sauce over the broccoli pasta, followed by the reserved 1 cup of cooking pasta water. Gently mix pasta to combine well with the sauce. Divide between serving bowls and garnish with spring onion and cheese if desired. Store any leftovers in an airtight container, refrigerated, for 2-3 days. *FInd nutritional yeast from your local health food store, supermarket or online. You may also use regular dairy cheese.